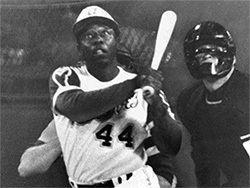 Hank Aaron reached the spring training camp of the Milwaukee Braves in 1954 at age 20. The power came slowly, increasing as the lean 6-footer used his wrists to supply a quick stroke. He had 13 home runs as a rookie that year before his season was curtailed when he broke his leg on a slide. He doubled his home run production in the two successive seasons.